Winner of the Christianity Today 2017 Book Award!Before he became a father of the Christian Church, Augustine of Hippo loved a woman whose name has been lost to history. This is her story.She met Augustine in Carthage when she was seventeen. She was the poor daughter of a mosaic-layer; he was a promising student and heir to a fortune. His brilliance and passion intoxicated her, but his social class would be forever beyond her reach. She became his concubine, and by the time he was forced to leave her, she was thirty years old and the mother of his son. And his Confessions show us that he never forgot her. She was the only woman he ever loved.In a society in which classes rarely mingle on equal terms, and an unwed mother can lose her son to the burgeoning career of her ambitious lover, this anonymous woman was a first-hand witness to Augustine’s anguished spiritual journey from secretive religious cultist to the celebrated Bishop of Hippo.Giving voice to one of history’s most mysterious women, The Confessions of X tells the story of Augustine of Hippo’s nameless lover, their relationship before his famous conversion, and her life after his rise to fame. 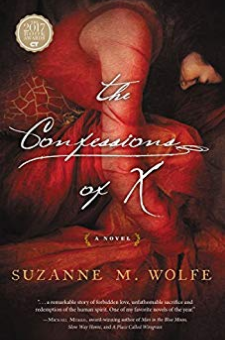 A tale of womanhood, faith, and class at the end of antiquity, The Confessions of X is more than historical fiction . . . it is a timeless story of love and loss in the shadow of a theological giant.